By the time you read this newsletter, I will have returned from the Skoll World Forum on Social Entrepreneurship in Oxford, England. The theme of this year's event is "The Power of Proximity." Here at Seva, we are well aware of the power of getting up close and personal, and how important it is to the work we do with and through our partners around the globe. Connecting with people in their homes and communities has always been an essential part of how Seva does its work. 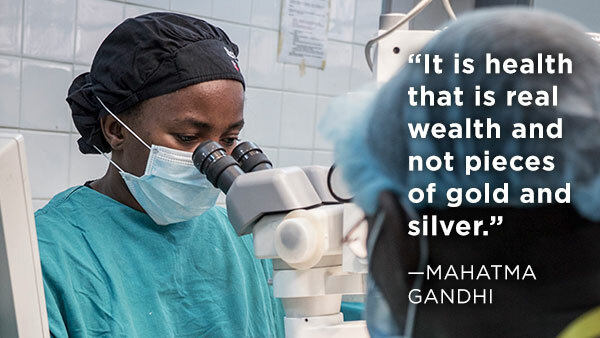 Whether through technological advancements like telemedicine, which allows an ophthalmologist to examine the retina of a patient hundreds of miles away, or old-fashioned relationship-building by community health workers, our work is all about expanding people's access to eye health services. Fundamentally, our success depends on connecting with individual people, often in locations that are well off the beaten path. Whether by providing transportation to surgical centers or expanding the range of eye care services that are available locally, we find ways to link people to the care that will maintain or restore their sight. Seva works with our in-country partners to build their internal technical and administrative capacity, as well as their ability to successfully reach into their communities to identify those most in need and connect them to care. By learning from the work of others around the world and integrating this knowledge into our own efforts, Seva is constantly moving closer to our vision of a world free of preventable blindness.